To read or not to read? That’s the question! 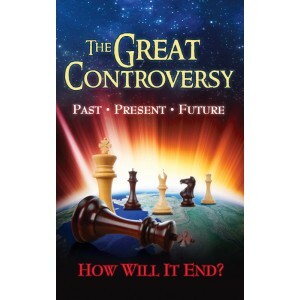 Many of you have asked about a book you received in the mail titled, The Great Controversy. It appears that many areas of San Antonio have been the target for a campaign to spread the information contained in the book far and wide. Here is a little background on the book and a couple of suggestions. The Great Controversy … contains the story of the past, the present, and the future. In its outline of the closing scenes of this earth’s history, it bears powerful testimony in behalf of the truth. … for in The Great Controversy, the last message of warning to the world is given more distinctly than in any of my other books. The Seventh-Day Adventists are a denomination of the Christian Church that believe that Christians must keep the seventh day (Saturday) as the Sabbath (in keeping with the Old Testament command). They also are strongly focused on the soon return of Christ (His advent). That is the reason for her emphasis on The Great Controversy. If you are interested in reading more about Seventh-Day Adventist beliefs from a Lutheran perspective, click here. The book focuses heavily on the teachings of William Miller, the founder of the Seventh-Day Adventist church. Miller teaches many things about the return of Christ that simply are NOT true according to the Bible. He also made several predictions about the end of the world and the return of Christ that simply did not happen. Many Adventists believe that The Great Controversy is divinely inspired. That is simply NOT true. My encouragement is to invest your time and energy in reading the Bible instead of The Great Controversy. If you are looking for another book to read this summer, let me suggest Celebration of Discipline by Richard J Foster. It will be GREAT preparation for our fall sermon series beginning the weekend after Labor Day. One more note: If you decide not to read The Great Controversy, please be environmentally responsible and recycle the book! Recycled the book the day it arrived. Thank you for your great response.